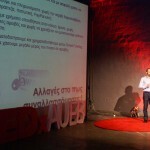 TEDxAUEB was an initiative of the students in Athens University of Economics and Business for the creation of the first TEDxUniversity in Greece in 2013. 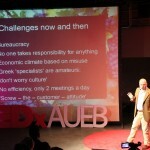 After the first and second successful events, TEDxAUEB is preparing the next annual event in 2015, driven by authenticity and creativity. In the spirit of ideas worth spreading, TEDx is a program of local, self-organized events that bring people together to share a TED-like experience. At a TEDx event, TEDTalks video and live speakers combine to spark deep discussion and connection in a small group. These local, self-organized events are branded TEDx, where x = independently organized TED event. The TED Conference provides general guidance for the TEDx program, but individual TEDx events are self-organized. (Subject to certain rules and regulations.